Just a thought, that I need your opinions on the below. I've been thinking that since the crank pulley is only used for the belt to the alternator(and to balance the crankshaft), to implement a rotor to the pulley and put a stator around it. Like the motorbikes have to produce current. 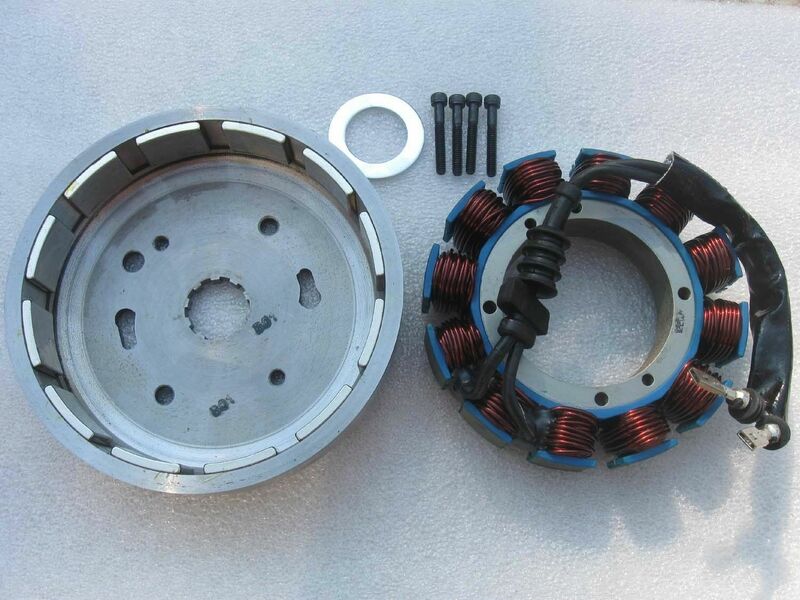 I've found online some Harley stator and rotor that produce 45A. Maybe with some machining, one could put the rotor on the crank pulley, balance it and built a case around to hold the stator with the correct clearances between the magnets. The case will be held in place with arms that bolt to the front and back of the engine block. Then use it's own regulator mounted somewhere convenient. Now, I don't know if the 45A is enough but in my case the radio, heater, rear heated window are almost never used. Also, my knowledge in electricals is close to zero, so even if I could make something like this, I don't know if it can withstand the rpm's, heat, load etc but if it's possible, then i'm willing to give it a try and built something! Any thoughts? Any stator from another bike that has more amps? I like the idea. I'd say 45a should be enough, same as a standard mini. This would also need wiring through a rectifier. Not sure what it would do to crank balance. Harmonics are the thing of witchcraft and I don't fully understand it but worth a go! Good luck if you take it on. Yes, the rectifier is small and can be mounted almost everywhere. I also have some some doubts about the harmonics but mounting a rotor around the crank pulley, a machine shop can balance the whole thing and i can't imagine being less efficient than having a belt tight enough which always puts pressure to the one half of the pulley to turn the alternator. Some use the CTR N1 single pulley but i hear mixed results, my opinion is that it's good for less than 300hp. Others machine off the OEM to remove A/C and steering assistance with good results. I was looking at Harley's site and they say the have a high output stator for the CVO that produces 54A@4000rpm and has enough power to hold heating grips and seats, stereo with 4 speakers, extra lights, bluetooth, ABS, intercom, TPMS etc. with max 793 watts. Mmm valid point! if you have it spinning at twice the rated rpm something will be cooking very fast! grate thinking and would solve the main fiting altinater and bracket problems ect! or what ever its called to charge a larger biger whatage batters, amp hour rings a bell,? revalution if you can do it!! high r,p,m wont be a problem because the size and way it works! its small O.D and the closer you get to the middle of a thrown circle the less is moves! No the CVO doesn't rev that much, it redlines at about 6100..
What do you think about the below list? Some bikes have car-like alternators but others seem a good candidate! All these bikes surely rev as high as 10k. There should be a stator/rotor out there with the right combination of output/rpm/diameter. I actually spoke today with a friendly workshop by chance and they said that if i'll find a rotor/stator and bring the crank pulley, they will help me find a way to mount it and do the machining and balance it! This is very intriguing. Will watch with hope. Looks a great idea, maybe an issue at the low rpm though as it seems to be falling off a cliff by 1000rpm so charging at idle if only around 700-850rpm may be a problem. I'm trying to gather as much info as I can and give it a try! Shouldn't cost much for a prototype. Another thing I came across, is that some stators are bathed in oil while others are dry. Any issue running an oil bathed stator dry? I'm not sure it's used for cooling anyway..maybe packaging and simplicity? Vulcan 1500 seems another good candidate btw. EDIT: Also, I think the overall mass of the machined crank pulley + the rotor should be the same as the the OEM pulley alone just for harmonics issues? I was reading at ATI's website that their smaller diameter harmonic balancer is limited up to 300Hp. Don't know if it's the diameter or the weight of the balancer has more impact. Last edited by jsouroufis; 26-06-2017 at 10:31 AM. i asked about bigger batt? and will that push enough into it? I'm still investigating this, looking for the ideal stator/rotor combo to produce enough current at low revs. I was thinking to attach the rotor to the inside due to it's bigger diameter and the stator to the outside cause it's easier to hold it in place and easier to cut off the smaller pulley of the crank balancer if needed. Another idea to hold the stator secure and exactly in the center of the rotor is to put a bearing to the pulley so to have the stator/rotor aligned while spinning and keep the stator with a bracket to turn freely on the bearing.